Our shipping labels are used in warehouses, factories, manufacturing plants and the shipping, LTL, and transportation industries. Every business that moves products or packages benefits from the efficiency and convenience provided by attaching a shipping label to their shipments. Custom-designed shipping labels communicate the key information needed in logistics. Labels inform every part of the supply chain about where a specific item comes from and where it is going. 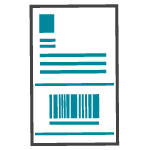 The label also provides information about the sender and the recipient and can include preprinted barcodes and variable numbering. Shipping labels can also be manufactured as books, pads or sheets. Whether you want shipping labels that are laser or inkjet printable, preprinted or custom printed, or compatible with your software format and corporate branding, count on the professionals at Chicago Tag & Label for the widest variety, quickest turnaround and most competitive pricing. We specialize in manufacturing integrated form labels that combine your shipping label with a packing list, merging multiple tasks into one simplified process. The form label eliminates duplicate printing functions, redundant work processes and matching errors. For more information about our form-label combinations, please click here. Based on your individual specifications, we can print custom labels with barcodes and consecutive numbering to expedite the way you process and transport shipments, improving business efficiency and profits. We also manufacture extreme-temperature and thermal transfer labels to suit applications in harsh environments.